Belmont teen Timmy Brownell recently won the U-19 US Junior Open. Like many teenage boys, Timmy Brownell grew up playing soccer and baseball. Because his father played hockey, Brownell played hockey. But Brownell’s mother, Christina, played and coached squash, so he also spent considerable time with a racket in his left hand. Brownell was intrigued by the game’s compelling mix of speed, skill, and strategy. “Squash takes a bit of everything,” he said. “You just can’t be a brute and run around the court. You need a really strong mental game. When Brownell entered Belmont Hill School as a seventh-grader, he was faced with a decision. A listing of venues to play squash in Greater Boston. “You can’t play two sports during the winter,” said Brownell, now a junior at Belmont Hill, “but by seventh grade, I was pretty good’’ at squash. Brownell made a wise choice. 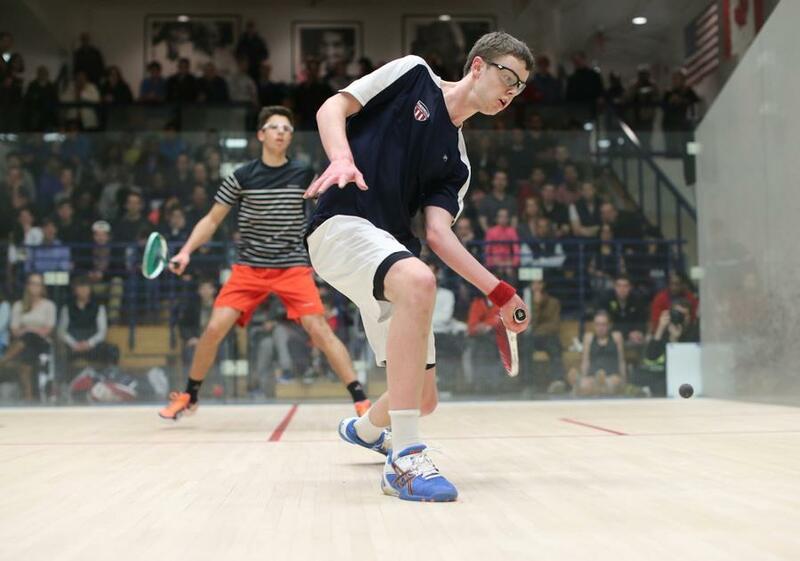 Last month, he won the U-19 draw of the US Junior Open, defeating France’s Auguste Dussourd in a five-game final held at Yale University. Squash has a reputation, considered by many to be the upper-crust cousin of tennis and racquetball. Today, squash is flourishing locally. Programs like those at Dover Squash & Fitness in Natick, where Mathieson has been the head squash professional since 2008, have helped. “When I first started at Dover, as the single pro, I had about 30 students,” said Mathieson. “We now have 200-plus students. To go from 30 students to 200 is huge increase in a game like squash in a single facility. Ripley Hastings, president of Massachusetts Squash, said junior programs are exploding. Like Brownell, Mathieson grew up playing squash. In England, where he was raised, squash was more available to the general public because it was offered at a number of “leisure clubs,” he said. In 2008, Mahmud Jafri, owner of Dover Squash & Fitness, established the Dover Squash Academy and hired Mathieson to direct the program. One key to the success at Dover Squash is that the club accepts all ability levels, not solely accomplished players, said Mathieson. The sport is gaining traction, he said, because it offers a tremendous workout. “There’s very little dead time, or lag time,” he said. “It’s not just physical. It’s not just mental. It’s got a great balance of both. You’ve got to be fairly quick, agile, flexible, and powerful. With only 90 seconds between games, players can barely catch their breath, so there’s also a premium on cardiovascular fitness. Squash is played indoors on walled courts, typically 32 feet long by 21 feet wide. Squash rackets have long, thin necks. The biggest difference is unquestionably the less-lively ball. Squash is played year-round, though the scholastic season runs November through March. The majority of junior players still come from private schools and colleges, but Mathieson said his goal is to see the sport accepted at all socioeconomic levels. According to Mathieson, the International Olympic Committee declined to add squash to the 2016 Games, and will likely pass again in 2020. “So we’re realistically shooting for 2024,” he said. And that just might be in Boston.